Stagecoach has been awarded a fresh contract to run services on its South West Trains franchise. The government said the group would pay £1.19bn for the right to run the routes for 10 years from February 2007. 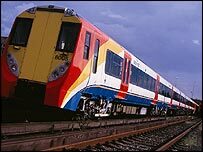 The South Western Network will be made up of two existing franchises, South West Trains and Island Line, both of which are currently run by Stagecoach. South West Trains runs services from London to destinations including Southampton, Bournemouth and Salisbury. The South Western rail franchise, which is the UK's biggest commuter rail franchise, runs more than 1,600 trains a day. Services in the new franchise include routes between London's Waterloo station and Portsmouth, Exeter, Bristol, Brighton and Plymouth. Stagecoach said it expected the deal to generate annual profits of £15m to £20m during its early years. "We submitted a high-quality, innovative and value-for-money bid, and the new franchise is an excellent result for passengers, taxpayers and our shareholders," said chief executive Brian Souter. The group added it planned to boost capacity on rail routes by running longer trains and more services during peak times. Rail Minister Tom Harris called the deal a good one for both passengers and taxpayers. According to Joseph Thomas, an analyst at Investec Securities, the franchise may generate about £138m for Stagecoach. Anthony Smith, head of customer watchdog Passenger Focus, said that while services had improved in recent years, serious concerns remained over fares and he warned that passengers did not feel they were getting value for money.